A busy birthday boy and his busy mom daydreamed this delightful hot air balloon themed party that was brought to life by Sweet Society’s Melissa. Since John’s favorite color is blue and he adores hot air balloons, mom Elena knew she had the perfect theme idea for her son’s third birthday, but not the time to do all of the planning. Melissa was able to pull supplies together to create a darling dessert table that celebrates John and his favorites in this “Up, Up and Away” party. I really like how the awning topped table provides a simple “wow” platform for the cake, cupcakes and other treats without overwhelming the room. The entire effect comes off as bright and cheerful, with a measure of whimsy and adventure—just the tone for a boy’s third birthday. The gorgeous balloon sculptures in this hot air balloon themed baby shower. The DIY hot air balloon at this boy’s birthday party. Under the awning, a light blue sky with fluffy, white clouds is a fitting backdrop; a singular, suspended pom adds dimension. The darling striped cake is decorated with red/ blue hot air balloons; a ribbon proclaims the birthday boy’s name and the number “3” nestles amongst clouds. The cake sets high in the sky on its white pedestal. Cupcakes are party ready in matching stripes, topped with a balloon and the number “3”. Vintage looking milk bottles and striped straws add a charming effect. The mini picket fence is a fun way to “tie down” balloon shaped cookies and cake pops. Textured bags hold chocolate bars for the journey. Artificial turf grounds the entire table. Miniature suitcases are tied with jaunty red ribbons and filled with blue “cloud” candy to take home. Notice the red ribbon favor detail coordinates with the ribbon on the cake. The table covering is a repeat of the bags on the dessert table. Stripes on the cake and cupcakes are even echoed on the wall covering. Paying attention to details creates cohesiveness in decorating that translates to clean… simple…fresh. It works very well in this venue. There are tons of good ideas you can take away from this party: hone in on the birthday boy’s interests, coordinate details and focus on the happy in birthday! 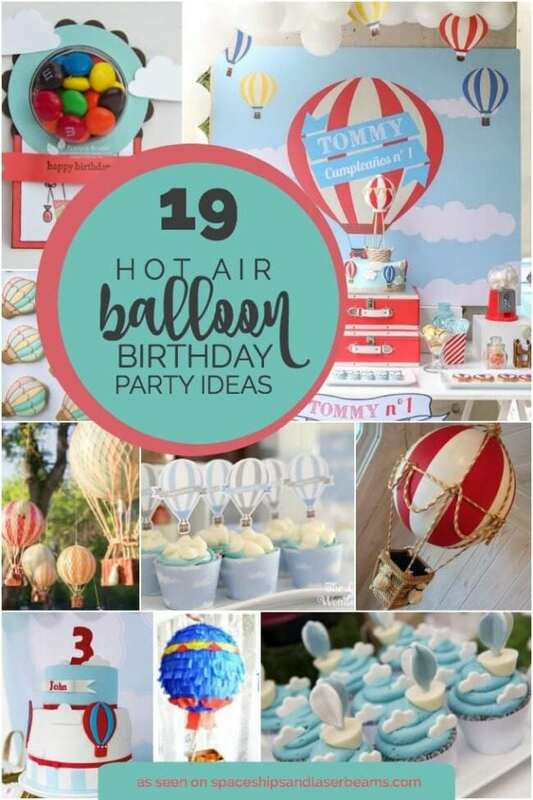 Check our more high-flying party ideas.